Above: Azerbaijan lost nearly 20 percent of their land to Armenian military occupation beginning around 1992. As a result nearly 1 million Azerbaijanis have been left homeless. A ceasefire has been in effect between Azerbaijan and Armenia since May 1994. Azerbaijanis still want their land back. Most people who were displaced still live under abominable conditions. Photo: Oleg Litvin, 1993. AI Editor: The majority of Azerbaijan's refugees fall into the category that U.S. Ambassador Holbrooke describes below. The U.N calls them "IDPs" - Internally Displaced Persons. Somehow, it doesn't sound as tragic as the word "refugees". 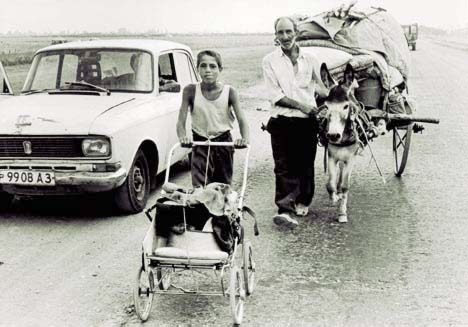 But hundreds of thousands of Azerbaijanis were forced to flee their towns and villages in Karabakh and the surrounding regions in the early 1990s when Armenians occupied their land by military force. 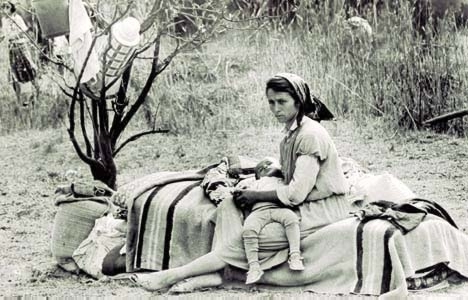 Helpless, they were left to fend for themselves and find refuge in other parts of their native land - Azerbaijan. The personal loss is indescribable. Most of them have lost all of their personal belongings, their sense of belonging to the land and community, the graves of their ancestors, their source of income, their position and role in society. As Holbrooke points out, they may even suffer more than "official" refugees do simply because of the way the international community perceives their situation. Imagine that you and your family are forced at gunpoint to flee your home; or that your house is burned to the ground and you have to go elsewhere for food, water and shelter. You wouldn't care much where you ended up, as long as it was safe and you got assistance. But there's a catch. If, in your flight, you crossed an international border, then you became an official refugee, eligible for assistance from the U.N.'s High Commissioner for Refugees (UNHCR). However, if you stayed within your own country the UNHCR would not take care of you. You might get some limited international aid, but not much of it. Your fate would be left in the hands of your government - even if that government's oppression was the very reason you fled in the first place, or if the government was unwilling or unable to allow access. You would be classified by the international community as an "internally displaced person" - an IDP - and pretty much ignored. Of course, there is no real difference between an "official refugee" and an internally displaced person - especially to the victim. The sterile and bureaucratic initials IDP have been enshrined in U.N. and international legal documents, but they are a euphemism that allows the world to ignore an enormous problem. We're talking about a huge number of nearly forgotten people. Today, there are at least 20 million internal refugees worldwide. The number of "official" refugees, on the other hand, has declined steadily since 1992 and now numbers about 11 million. While both figures are disturbing, the trends clearly have reversed. In Sudan, for example, nearly 4 million people have been internally displaced; in Sri Lanka, more than 600,000; in Azerbaijan, more than a half-million, many of whom live in railroad cars. According to recent estimates, the Congo has more than a million internal refugees. As Julia Taft, Assistant Secretary of State for Population, Refugees and Migration, has repeatedly noted, the number of internal refugees has more than doubled during the past two decades. The rise in these numbers represents a subtle but noticeable shift in geopolitics: During the Cold War, refugees crossed borders to escape governmental threats. But conflicts in the 21st century (Chechnya, the Congo, Angola) are more fractured. Internal refugees in the Congo, for example, are fleeing a multiplicity of armies from five countries, as well as an even larger number of rebel movements. The support the international community provides to such people is woefully, horribly inadequate. While Sadako Ogata, the dynamic head of the UNHCR, recently issued a more forward-leaning paper on internal refugees that acknowledged the "uneven and in many cases inadequate" response to this issue, humanitarian aid donors continue to make far fewer resources available to internal refugees than to others. Non-governmental organizations and the Red Cross do give some assistance to such refugees, but they cannot handle the situation alone. Moreover, the U.N. system's reliance on what is called "coordinated" response all too often turns out to be another euphemism - for ineffectiveness, in this case. In bureaucracies, "co-heads" usually means "no-heads." Victims fall through the cracks. The primary mandate for internal refugees should be given to a single agency, presumably the UNHCR. This suggestion has been criticized by some in the international community as unfair to other agencies, but no one should be defensive when it comes to taking action. Criticism ought to be welcomed if it stimulates reform. Designate a lead agency for each internal refugee situation that arises and clearly define that agency's responsibilities. In most cases, it will be UNHCR. Have all U.N. humanitarian agencies designate a single point of contact on internal refugees. Keep better track of these emergencies. For example, the U.N. Secretary General should issue regular, comprehensive country-by-country reports on the state of the world's displaced people and what the U.N. is doing about them. Make it clear that protecting and speaking up for internal refugees is just as important as making such efforts for "official" refugees. Unfortunately, some humanitarian and development agencies still don't seem to see that as part of their mandate. Do more to support the efforts of Francis Deng, the Secretary General's Special Representative on Internal Refugees, who has played a seminal and visionary advocacy role. Deng is a part-time, voluntary employee who receives budgetary support for only a few trips a year and is dependent upon other U.N. agencies for staff support. If we can draw the world's attention to the plight of these people; if we can pressure governments to protect these innocent victims and secure access for aid groups; and if we can design assistance programs around the principles of predictability, accountability and universality - then we will have taken a major step toward alleviating this serious problem. We can ignore it no longer. From Azerbaijan International (8.2) Summer 2000.